This is in my homemade snowglobe series which depicts the harsh realities of living in the Western landscape in contrast to our romanticized visions. One of the most dangerous elements of living off the main highways is the possibility of getting stuck in a windy snowstorm (especially before the days of cell phones). Many people have gotten lost and froze to death attempting to walk home in a blinding blizzard. 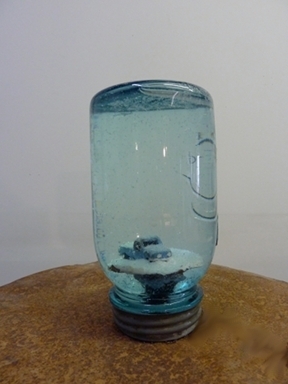 Materials: sculpty clay, water, glitter, old blue Mason jar and zinc top.